The Premium Hiking Regions certified by the German Hiking Institute are the avant garde of European hiking destinations. Hikers are guaranteed a full hiking experience. The Saar-Hunsrück Premium Hiking Region received this certificate in September 2015 as one of the first regions in Germany. 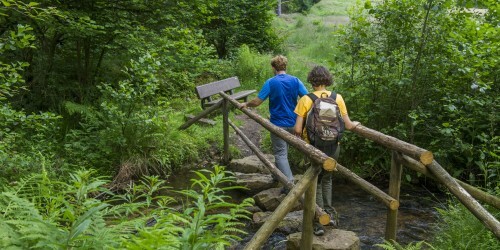 Our core offering of hiking trails is the Saar-Hunsrück-Climb as a Premium long-distance trail, plus the 111 Saar-Hunsrück “Dream Loops” as Premium circular hiking trails. 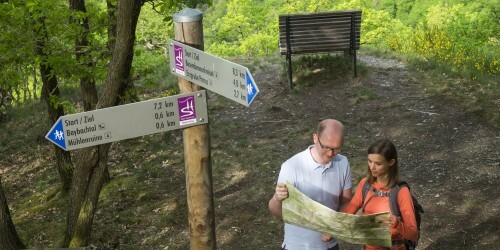 Premium walking trails: There are now 3 Premium walking trails. One is in Morshausen in the Consolidated Community Emmelshausen, the walking trail Murscher Overlook, and 2 in Mettlach on the Saar Bend in Orscholz, the trails Weitblick and Überblick (wide vistas and overlook). Further Premium walking trails are planned. Distance Hiking Trails: The Schinderhannes Path, about 18.6 mi/30 km long, joins the Saar-Hunsrück Climb from Kastellaun via Simmern with the Soon Forest Trail near Gemünden. Longest Hanging Rope Bridge in Germany: The hanging rope bridge Geierlay in Mörsdorf is accessible for hiking via a circular path in Leg 21 of the Saar-Hunsrück Climb. Treetop Path (Baumwipfelpfad) at the Saar Bend: at 0.81 mi/1.3 km, the Treetop Path lies directly on Leg 2 of the Saar-Hunsrück Climb and at the start of the Dream Loop “Cloef Path”. Guests have a comprehensive information system available. All offers are given together on the collective homepage. The different materials such as the Dream Loops brochure, the newspaper for guests, or the Saar-Hunsrück Climb Hiking Guide summarize all elements of the offers. Guests can obtain all the important information on site at the numerous certified tourist information agencies. Whoever wishes to arrive by train or bus has the relevant Dream Loops at the Train/Bus button available on the homepage and in the brochure. There is at least one certified Quality Host per trail from Hikable Germany directly on the trail or in the vicinity. The Saar-Hunsrück Hiking Hosts are both Quality Hosts from Hikable Germany and members of a regional initiative. Regional products and regional dishes are a fixed element on the menu. They are listed on the homepage under “Hosts” and in the relevant brochures. The hiking region offers an extensive, greatly varied, innovative year’s program with hiking events. The highlight is the annual Saar-Hunsrück Marathon.